There has never been more choices for the back of your pin. 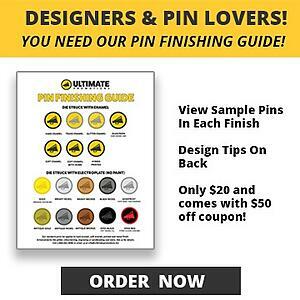 Take a moment and get up to speed on the industry jargon so you can decide which type of pin back is the best option for your next project. All custom enamel pins come with a free attachment called the "butterfly clutch". We've all seen them and to be honest, we have no idea what this thing has to do with butterflies! The jist of it is that you pinch two metal doo-dads together so that the clutch releases from the post. You can specify gold or nickel butterfly clutches at time of order. If you don't specify, chances are you'll get a silver coloured one. The nice thing about rubber clutches is that you can get them in different colours. We sell black and yellow rubber clutches. It also adds another colour to your enamel pin design. Note that it's our opinion that this clutch doesn't stay on as well as a metal one. On a side note, they are actually made from PVC, not rubber. This attachment may be of interest to designers wanting a higher end look. This clasp is made from solid brass and takes a bit of work to attach and remove. It adds a bit of cost as well. Some people don't like the idea of putting a pin through their $600 suit jacket or silk scarf. For a small fee, you can get magnet backs. It's our opinion that you want a fairly large design (ie 1" or higher) in order for this to work well. You can get you a smaller magnet but we don't suggest it. In most cases, you have a specific need for a screw post. Typically this attachment is used for pins that are worn by military or law enforcement. Here we go again with the industry jargon! You'll find multiple names for this attachment out there. Basically there is a pin on a hinge that requires a bit of dexterity to open and close. The good news is that bad-boy probably is not coming off your garment any time soon. If you require more information or pricing on these attachments, contact us.